We are dedicated to serving the needs of pets and the people they own. We provide our customers with the highest quality pet foods available anywhere. We want you and your pet to have the best, longest, happiest, and fulfilling friendship possible. Food, in its original unprocessed condition offers a great variety of nutrition. Scientists are constantly finding new nutrition in natural, fresh foods. As much as we try to reproduce nature and create synthetic supplements, we are always at least one step behind. We seem to forget there might be more benefits contained in many plants, we have not discovered yet. Not only are there important, undiscovered parts of a plant missing in artificially constructed foods, but consider the composition of natural foods. We at Totally Organics are convinced that natural foods provide a combination of nutrition that is more readily absorbed by the body than the man made combinations. For example, seaweed contains about the same amount of minerals as ocean water in the same perfect balance as nature has created it. That is one reason why we use Dulse in some of our products. As we learn more about how food affects not only our bodily health and well-being, but also our mental and physiological conditions we are transferring this concept from humans to our birds. When we look around us we can see the connection of food and behavior everywhere. Give your children some sugar and see how they get hyper within the hour. The same goes for different chemicals. Why do we eat certain foods and instead getting more energy (food is supposed to be fuel for the body) we get tired or irritated? If you would fill your car with gasoline that makes the car slow down and maybe even causing problems, would you get that gasoline again? Probably not. But most of us do that very same thing with food to our bodies on a daily basis. And this is true for every living being, human, animals and birds. If a body lacks any kind of nutrients, it usually starts showing it by not feeling quite right. How many issues like screaming, plucking, biting are caused due to not being at ease, because the food we offer our birds is lacking something or leads to some kind of lack? 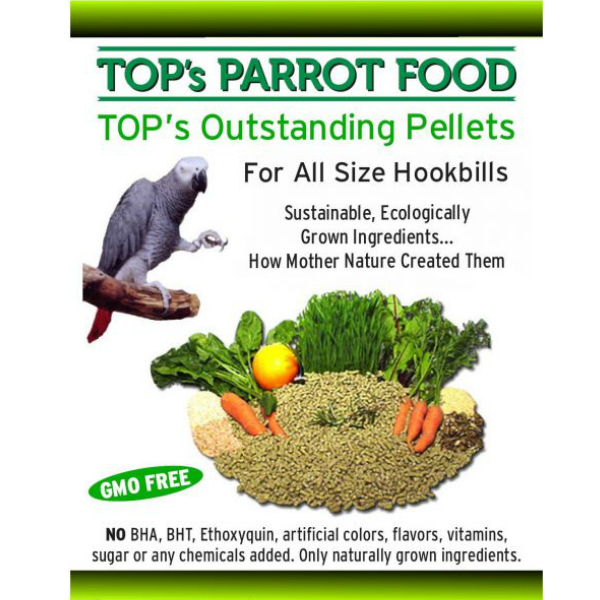 With this knowledge we here at Totally Organics were looking for a natural, organic parrot food. Fresh vegetables and fruits, nuts and seeds should be part of a healthy diet for a parrot. But too many nuts and seeds are not good for most birds. We don’t want to leave fresh food for too long in their bowls. So, a natural food that does not spoil fast, but provides a variety of vitamins, minerals and more. We couldn’t find it! This was the start of TOP pellets. 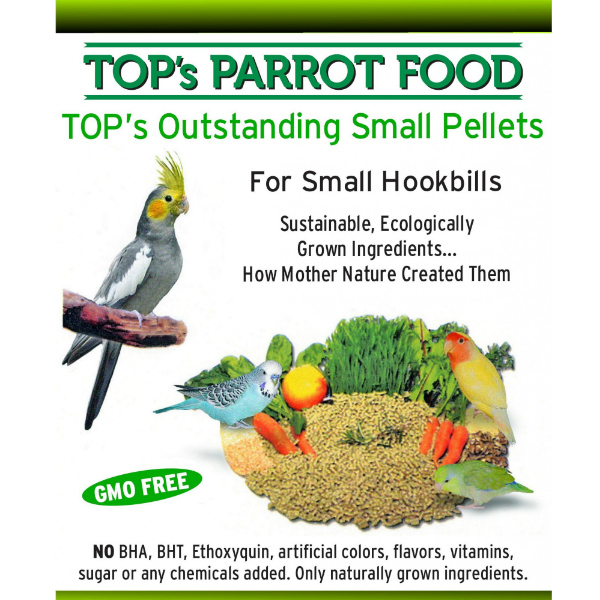 It still is astounding how fast many birds, even very picky eaters, adapt to our pellets. People started asking what seed mix we were feeding to our birds and if would could not sell it to them. 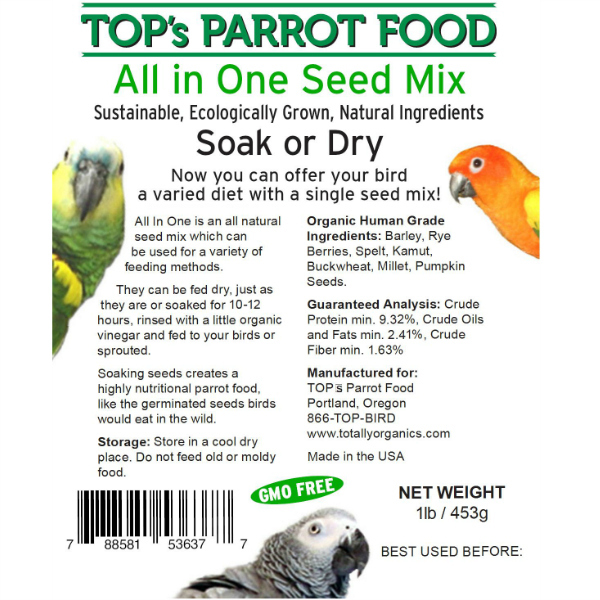 And after feeding it for many years to our own birds here, All-in-One™ Soak and dry mix went on the market. Many parrot species eat seeds in their natural habitat. Most of these seeds are germinated. The germination process turns seeds into little power packets of nutrition. When they are soaked they activate their slumbering nutrition and get ready to produce a plant. Right before they open and start pushing the first little sprout out, the seed is at the top of its nutritional state. Knowing that, we were feeding our birds an organic seed mix that we soaked 8-12 hours, just long enough to produce the same effect as the natural germination. Our All-in-One™ seed mix can be fed dry, soaked or sprouted. Next we started looking for an organic seed mix for small birds. 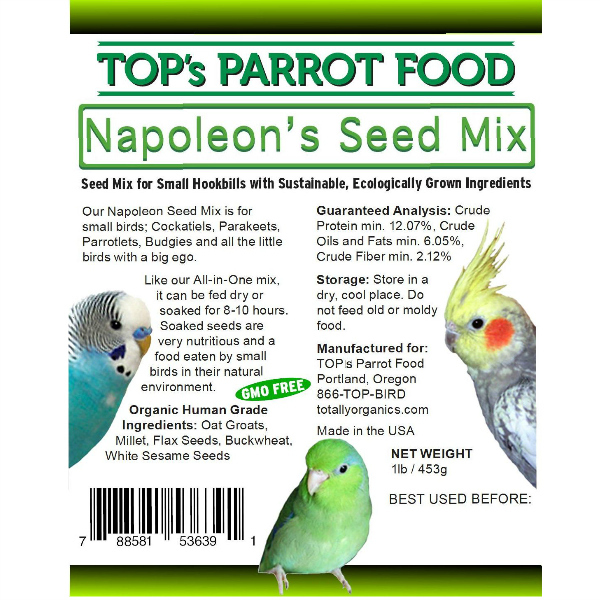 And now we offer our Napoleon’s™ Seed Mix for all the little birds that think they are 10 feet tall. Naturally this mix can be feed dry or soaked like the All-in-One mix too.